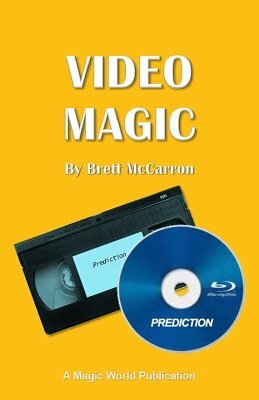 Use your VCR as a video prediction chest! Add amazing, audience-tested effects to your act, including French Postcards, Jokers Wild, Batter Up!, Break the Bank, Headlines of the Past, Mental Shopping, Lucifer's Lexicon, Movie-ola, Mental Lottery, and many others. The subtle methods are broken into chapters where you'll discover the Three Outs Principle, The Multiple Outs Principle, the Index Principle, The Ultima Principle, and more. The author had previously sold this work only through Micky Hades' Seattle retail shop, which has since closed. The material in this ebook is just too good to forget. With the advent of smartphones, GoPro cameras, and YouTube, smart performers are going to find gold within these pages and put the routines to work. Billy McComb, Genii magazine columnist, said of this monumental work, "Some of you will make reputations with this!" 1st edition 1988, revised 2015, 98 pages.